All things must come to an end and that time is here for America. Growing up, I wondered if we would be the exception. I thought that it had a chance since we have a strong government and a people who have the same basic beliefs. Of course, the race problem was serious and a blight on our history that will never go away. But still, we could work it out. And years later, it appeared that some kind of move toward justice and respect for all races in the daily interaction among our “citizens” was making progress, though not always smoothly. But over the past decade, a new threat to our very survival as a nation has made itself known. This threat emanates from our leaders, who have joined with other world leaders in a mission to destroy the sovereign nation state and replace it with what some have called the New World Order. These current leaders meet in secret, in the shadows, away from the public, behind steel fences with armed guards. They plan their actions in places like Toronto, Montreal, Guadalajara, Cancun, New Orleans. The supporting cast includes former politicians, ex-members of the military, and academics, both Republicans and Democrats. Business groups from all three nations, Canada, Mexico, and the United States, have a special part in this destruction of the three nations. The phrase, New World Order, was used frequently by George H.W. Bush in speeches around the world, and he made it clear that regional government and international law would replace the out-dated nation. This New World Order would consist of economic regions of the world, with regional governance. All regions would be integrated through harmonization of standards and processes. And this world would also “be based on international law.” That was part of George W. Bush’s joint communique at a meeting with the president of the EU council in Slovenia after discussing deeper integration between the European Union and the United States, June 8, 2008. The European Union is in accord with international law and the United States would be soon, if no one objects. Borders would be open globally and citizens accounted for on shared data bases. At least two changes mobdro apk download android must be made in the U.S. Constitution before that happens. There are no first and second amendments under this global legal system. Many of the things you could say before (internet included), you won’t be able to after international law is in place. In the European Union, you can be arrested and charged for hate speech for something as simple as denying the holocaust or criticizing Islam. If convicted, you can be put in prison for three years. It began with NAFTA (North American Free Trade Agreement) under George H.W. Bush and pushed through Congress by Bill Clinton. Trade agreements made it easy for corporations to profit at the expense of labor and the environment. Trade agreements trump U.S. laws and the Constitution. When George W. Bush came to power, he pushed his father’s goal of uniting 34 nations of the Western Hemisphere into a Free Trade Area of the Americas (FTAA), a trading region with governing rules and regulations. If any of these regional regulations were in conflict with the laws and regulations of governments of any member nation, those of the FTAA would prevail. This attempt at a western European Union failed to get enough support. 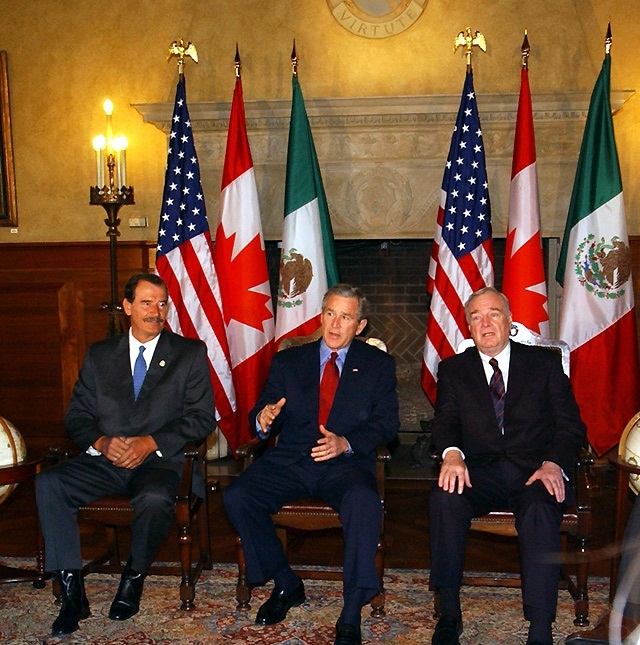 George W. Bush, Vicente Fox of Mexico and Paul Martin of Canada then met and signed an agreement to integrate North America under the Security and Prosperity Partnership of North America (SPP) in Waco, Texas on March 23, 2005. No details were published. It became known as NAFTA Plus, a deeper integration of the continent. Click on image to enlarge. The corporations of North America, through a Task Force on Building a North American Community, published a plan, the road map for this integrated community of North America. It was utilized by the three nations’ leaders as a road map to build this community, with regional governing institutions (appointed) to operate this region. The State Department has a document that praises the Council on Foreign Relations Task Force plan for Building a North American Community, with a link to the plan. A trilateral group of advisers, consisting of ten CEO members from Canada, Mexico, and the United States, were appointed to the North American Competitiveness Council (NACC) in June of 2006 at the U.S. Department of Commerce. They have met with each nations’ ministers and “advised” them on regulations, policies and laws they needed for building and running a continental trading region for the benefit of corporations. The U.S. branch of the NACC met with the Secretary of State, Secretary of Homeland Security, and the Secretary of Commerce, and gave their advice to these ministers, with the knowledge of the President. The ministers then made sure that the appropriate legislation was implemented. Some of the first members of the U.S. branch of the NACC were Wal-Mart, GM, and Whirlpool. This is supposed to be a permanent institution but bad publicity drove them into the background. However, they are evidently still advising Obama, Calderon, and Harper of Canada. After all, the North American Community is their project. American citizens don’t even know about it while the leaders continue their annual summits, working on deeper integration of North America. An important part of the plan for Building a North American Community is a common security perimeter encircling the continent. It is based on the European Union outer perimeter. With this outer perimeter and open interior borders for all citizens of North America, it means that Mexicans, Canadians and Americans can “live and work” anywhere on the continent. The end game for North America is a European Union type of arrangement with a constitution that requires changes in each member nation’s constitution, the same process that the EU is undergoing now. Some of the institutions are already in place, including a North American trade tribunal, with plans to make it permanent. There is also a rapid response force for North America, USNORTHCOM, to deal with civil unrest and other problems on the continent. It consists of the military and agencies from Canada, Mexico, and the United States. USNORTHCOM is currently in Mexico helping the Mexican Army fight the drug cartels. The key to making this North American Community a reality is passing a law that changes our borders with Canada and Mexico. Comprehensive immigration bills, in Congress for the last five years, have all failed to pass. All of these immigration bills contained a mandate to construct a common security perimeter around North America. Two of them, H.R. 4321 and S. 3932, are now in committee. In addition to a new border, these bills would eventually allow all citizens of North America to work in the United States. That means 105 million Mexicans can come to America and drop wages drastically by continuing to take American jobs in all classifications. Unemployment among American citizens will increase. Mexicans in general don’t like Americans, even more so for white Americans, for stealing the Southwest U.S. from them in the Mexican/American War of 1848. 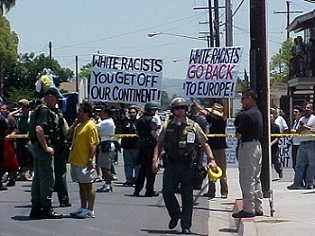 They want to send whites back to Europe and reconquer America. It’s been called the reconquista and they are doing exactly that, capturing America by demographic dominance, with the help of American presidents, Republican and Democrat. They refuse to secure our borders in order to construct this North American Community with a new race. The Mexicans will be the new Americans, who will receive low wages and “still” manage to support 78 million retirees over the next 40 years. Meanwhile, Demonstrations and violence by Illegal Mexicans and Mexican-Americans has been increasing against black Americans and white Americans for two decades. More evidence here. The evidence is clear and compelling but this news is suppressed by the national media. Mexicans attack American citizens in America without fear of being arrested by the police. 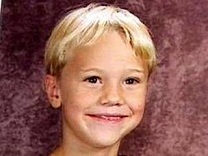 The violence has increased greatly over the years and is chronicled on local news out west but never reaches a national audience. And more Americans have been killed by Mexicans and OTMs in the U.S. than have been killed in Iraq and Afghanistan. See immigrations human cost, then scroll down to Jordin Paulder. If an immigration bill is passed and signed by Obama, America will be finished. The process of deconstructing our nation will be on the fast track. And most Americans still won’t have an understanding of what’s happening. Many will still have faith in their elected leaders, the ones who destroyed their nation and the ones who stood by and did nothing. “A nation can survive its fools, and even the ambitious. But it cannot survive treason from within. An enemy at the gate is less formidable, for he is known and he carries his banners openly. But the traitor moves among those within the gate freely, his sly whispers rustling through all the alleys, heard in the very hall of government itself. For the traitor appears not a traitor-he speaks in the accents familiar to his victims, and he wears their face and their garment, and he appeals to the baseness that lies deep in the hearts of men. He rots the soul of a nation-he works secretly and unknown in the night to undermine the pillars of the city-he infects the body politic so that it can no longer resist. A murderer is less to be feared.” Cicero.